Lower back pain isn't the same for everybody. In severe cases it can persist throughout the day (and night), no matter what position you're in. In other cases people only have pain when they are in certain positions. Many times people experience lower back pain that's worse at night or when they're getting up from out of a chair. A very common issue we see is lower back pain when lying down flat. It can be mild or very painful. It can be hard to diagnose exactly what causes such pain. But there are some common reasons to experience pain when lying flat. One common reason people feel pain in their back when they lay down is a general misalignment of their spine. The facets of their joints don't line up properly. Usually it's an issue of chronic bad posture. It's often due to core weakness and lots of sitting. Another way you can get this misalignment is by having tight hamstrings. If you lie on your back and you have tight hamstrings, your body will compensate by arching your low back further upward. This creates stress and leads to pain. Although sciatica is often acutely felt in the legs, you can still experience low back pain when you're laying down with sciatica. There are many factors that can leave you susceptible to sciatica, which affects both athletes and those who are less active. People who lead a sedentary lifestyle are more likely to develop sciatica than active people. However, endurance athletes are also prone to experiencing sciatica from overworked and stiff muscles. Staying in bed for any prolonged period can make you stiff and increase pain. When you don’t move and bend, you lose muscle strength and flexibility. With bed rest, you lose about 1 percent of your muscle strength each day. And you can lose 20 to 30 percent in a week. It becomes more difficult to return to any activity. As you become weaker and stiffer your recovery takes longer. Ankylosing spondylitis is a chronic inflammatory disease that primarily affects the spine, particularly the sacroiliac joints near the pelvis, and the hip joints. Ankylosing is a term meaning stiff or rigid and spondylitis means inflammation of the spine. Enthesitis (inflammation of the place where ligaments and muscles attach to bones) accounts for much of the pain and stiffness of ankylosing spondylitis. This inflammation eventually can lead to bony fusion of the joints (where the fibrous ligaments transform to bone, and the joint permanently grows together). If you're consistently sleeping in the wrong position you could give yourself low back pain. 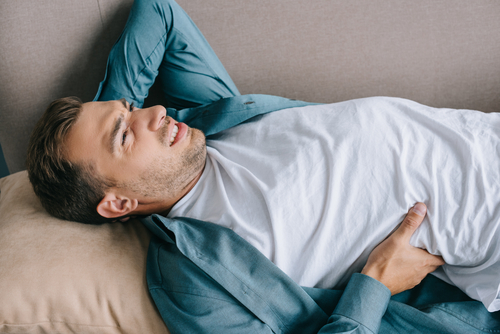 Stomach sleepers end up arching their backs upward more than you should for a prolonged period. As a result you put stress on your lower back, leading to pain. In some cases you can modify by using a thinner pillow (or no pillow at all), but you're likely better off choosing a new sleeping position altogether. If you're unsure about the cause of your pain it's always good to consult your doctor. Most cases of lower back pain can actually be greatly improved by following an established pain relief protocol. Targeted spinal release therapy works as an effective home back pain treatment, especially for lumbar pain. Cognitive therapy is gaining attention as another useful method that shouldn't be overlooked. The good news is that low back pain is not a life sentence. With some patience and adjustments you can get get back to living comfortably.